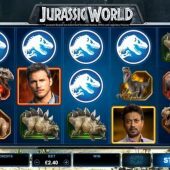 Jurassic World slot is the second Microgaming slot of this movie genre, after their famous and outstanding 243-way Jurassic Park slot from 2014 had become a favourite amongst players. This time we get a game based on the 2015 movie, which is in fact the fourth in the Jurassic Series starring Chris Pratt and Bryce Dallas Howard and like the rest was a box office hit. In keeping with the Microgaming philosophy of making the most of their trademarked slots we get clips and soundbites from the movie and great graphics and animations when certain events occur. Often in Hollywood sequels tend not to live up to the success of the initial movie, but will this be the case here with Jurassic World? Microgaming have been careful not to interfere with the original formula too much, yet must balance this with the game being distinctly different. We still get the 243-way format over 5 reels of 3 rows and the interesting free games rounds and in-play random features, a good start. 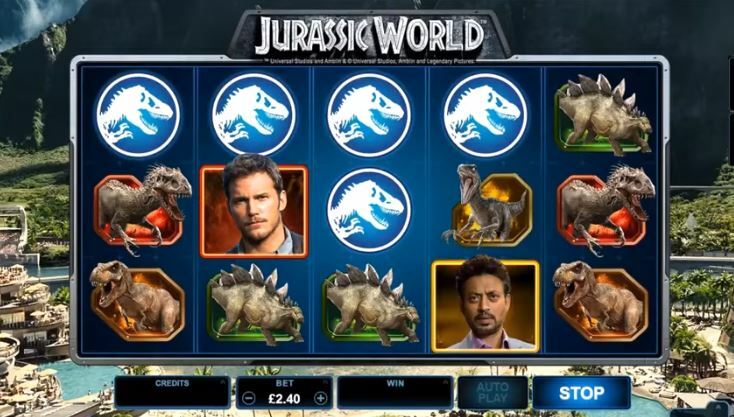 Like before the icons are single except the Wilds and we open the game with a movie scene which then settles down to sit over a background from Jurassic World itself. The characters remain the best pays aside from the Wilds and are similar too to the original and pay 15 down to 10x for a 5-of-a-kind win. There are fossils depicting the lower awards of various types but we get a change in the stacked Wilds to light blue the same as Thunderstruck 2 slot and these are the highest award for all 5. Luckily Microgaming have kept the random in-play appearance of the T-Rex and you'll be shocked (and scared!) of how much you can get, because he may appear after any win in the Indominus Rex mode and put a multiplier up to a staggering 1000x on the total! You'll instantly recognize the Amber scatters which have been retained but are bigger than before but you still require 3 or more anywhere in view for the choice of bonus free games rounds Jurassic World offers. There is even an extra benefit for those annoying 2-scatter spins which don't result in a feature. They've done this before with a bet multiplier on Game of Thrones slot if you only see 2, but here I think it's better as they turn into Wilds should no third appear! Gyrosphere Valley - you receive 10 free games with a multiplier trail. You begin at 2x and every losing spin increases this by 1 to a maximum of 7x. Creation Lab - again 10 free games but this time with Rolling Reels so winning icons are removed and replacements drop down. Unlike other Microgaming slots with this feature such as the Michael Spins on Immortal Romance, you get 'Cryo Wilds' which as you may know means 'frozen'. Any Wilds will freeze and their ice will melt over the next few cascades until they have melted away. Raptor Den - 10 free games but now as well as normal Wilds any scatters appearing will become extra Wilds and become sticky until 3 have appeared. At that point they will vanish but you will get 5 extra spins!